Figure 2-22. 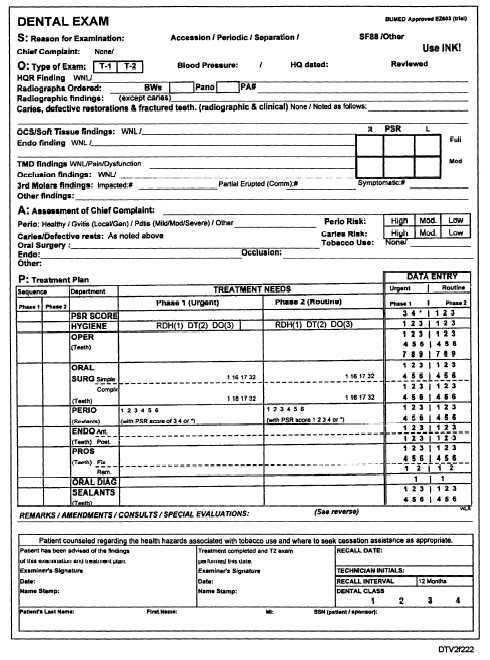 - Dental Exam Form, BUMED-approved EZ603. The reverse side of the EZ603 (which is blank) is provided for recording the narrative comments associated with the dental exam and related consultation. Commands are authorized to overprint this section with command specific formats that will facilitate the completion of the dental examination. For placement in the Dental Record, the EZ603 is placed with the Plan or "P" side facing up. It is located on top of any accompanying EZ603As and under the Current Status Form. This form (fig. 2-23) functions the same as the old SF603 (side 2) and SF603A with the exception of no pictographs of the teeth. Record the completion of all dental treatment such as the treatment plan, dental emergencies, results from Report of Medical Examination (SF 88), and any other narrative dental findings on the EZ603A.